After the Twelfth Night of Christmas festivities and food hangovers, we were left with well over a dozen cheeses from an Argentinian soirée at New Year. What to do with them on a lazy Sunday? One leftovers fallback plan is a quick French bread baguette pizza, with or without the tomato, but certainly with the cheese. Item one was easy, spinach and Brie (with added red onion slices) in a hot oven for 10 minutes – also a great warmed Croissant filling, and then some sliced grapes and caramelised red onion chutney on top to finish. Item two was an experiment. A successful one. Some thinly sliced spiced chorizo ring was laid atop some halved French bread, a drizzle of garlic and chilli sauce optionally splashed across. Next some crumbled Stilton cheese. Bearing in mind how salty and strong flavoured both cheese and chorizo could be in this case, considering chorizo is more often paired with hard Manchego, it’s worth being restrained rather than generous with the topping depending upon the strength of the Stilton. 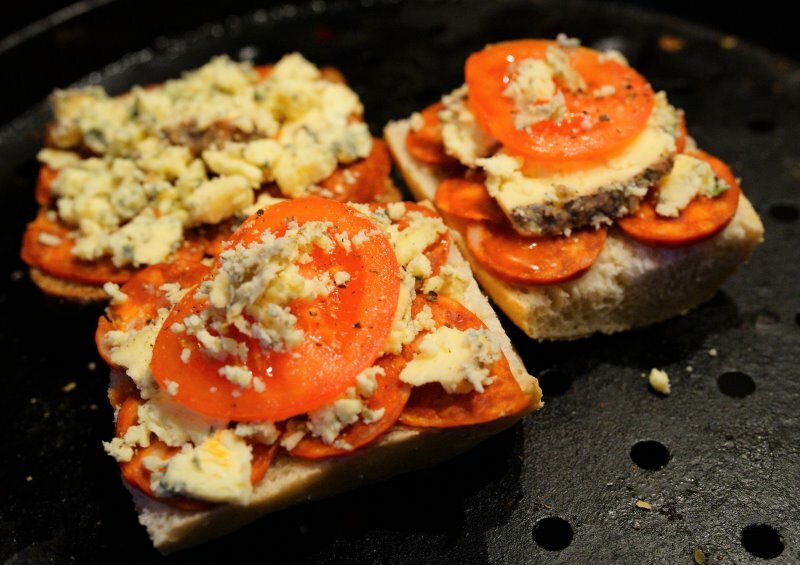 To finish, add an optional slice of tomato and a few more sprinkles of Stilton crumbs on top. Barely 5-8 minutes in the pre-heated oven set to a high temperature and the cheese has melted down and the orange-red chorizo fat has spilled its juices too. 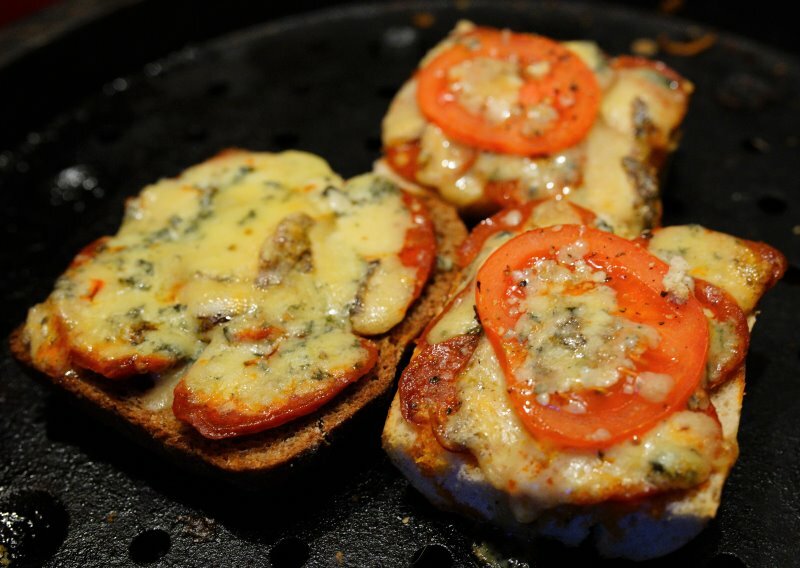 The melted Stilton pairs perfectly with the crisping oven-cooked Chorizo. Don’t overcook the Chorizo, if sliced thinly you just want it to curl up creating a concave spoon shape holding its leaking oils for the stilton to melt into. I added a delicate blob of fruity Coriander & Dutch chilli jelly on top but my culinary partner-in-dine preferred theirs without. The chilli jam goes perfectly with the Brie or Stilton, in this case, and can be purchased from Chilli Fundamentals. The snappy 15 minute dish washed down well with a smooth peppery 2011 Lagunilla Rioja Reserva fine wine, available for around £9. 2011 was a year that created some intense powerful concentrated Riojas. Why not try Broccoli, Stilton & Chorizo tart, Chorizo and Stilton soup, Chorizo and Stilton risotto, or Chorizo and Stilton pasta, or make your own ground Beef burger with either Stilton and Chorizo in the burger or layered on top, melting down.